Decentralization started in Ukraine back in April 2014 aiming to decrease the level of public corruption at central level by transferring a considerable part of the powers and, most importantly, funds to local authorities. Since then many things have changed within the country: new territorial units have emerged – amalgamated territorial communities (hromada), a mechanism providing them with bigger financial independence and wider powers in governance is operational. The key gain is that millions of common Ukrainians came to believe that positive change may start not only in a top-down manner – with adoption of laws or orders, with the change of the President or re-election of MPs, but also in a bottom-up way – from their own initiatives set to improve their life. UCMC teamed up with “1+1” TV channel and supported by the US Agency for International Development (USAID) joined an effort to contribute to the reform communication by creating a social project “A Million for the Community” (Hromada na million). In 48 hours the project did not just manage to resolve a problem of a multi-child family but to also persuade millions of TV viewers how important being socially active is. In the reality TV show “A Million for the Community” one of Ukraine’s leading commercial TV channels “1+1”, was following five most proactive amalgamated territorial communities (hromadas) that were competing for investment by creating projects set to bring real change to their cities and towns. The show sought to motivate each community to live up to and demonstrate the best level of self-management, inventiveness and social responsibility. The project’s main prize is UAH one million (approx. EUR 31 thousand) provided by the Western NIS Enterprise Fund (WNISEF). Five amalgamated territorial communities – hromadas from the West, South, and East of the country, took part in the show. They are Skala-Podilska hromada of Ternopil region, Pechenizka hromada of Ivano-Frankivsk region, Novopskovska hromada of Luhansk region, Buzka hromada of Mykolayiv region and Kniahynivska hromada of Volynska region. In each episode of the TV show, the participating hromadas were tasked by the hosts of the show. They were then scoring points and were thus getting closer to the main prize. The decentralization reform started in April 2014. Since then a new package of laws has been formed and is in force. The laws amended the Budget and the Tax Codes of Ukraine. Resulting from these changes, local budgets grew by UAH 123,4 billion (approx. USD 4,7 billion) in the first three years of the reform: from UAH 68,8 billion (approx. USD 2,6 billion) in 2014 to UAH 192 billion (approx. USD 7,4 billion) in 2017. The share of local budget revenues in Ukraine’s overall state budget is constantly growing, by the end of 2017, it reached 51,2 percent (against 45,6 percent in 2015). The Law “On voluntary amalgamation of territorial communities” became an important component of the reform and made it possible to form the basic level of local self-governance. 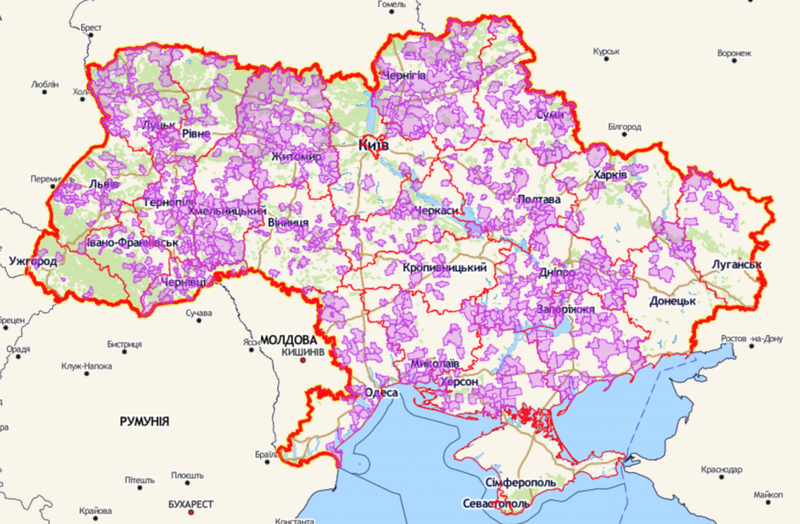 As of the beginning of March 2018, 725 amalgamated territorial communities have been formed in Ukraine, with the 6,3 million of the population. International experts assess these dynamics of intra-municipal consolidation as very high. One of the episodes of the TV show aired on February 4, 2018, was considerably different from others. Hromadas were tasked to invent and implement a social project in 48 hours that would make the dream of a member family come true. Who of the hromada members needs assistance? Where the resources to provide it should come from? How should it all be organized? How to impress the jury of the competition with a beautiful charity move? These are some of the questions that all five participating hromadas faced. They had just two days for it all, and they were followed by TV cameras. The choices that the hromadas made were different. Skala-Podilska hromada chose to help the families with little income by providing them with clothes and firewood. Pechenizhynska hromada made an attempt to improve the life of a family where children lost their parents and are being taken care of by the oldest brother. The good deed of Kniahynivska hromada would lead to making the dream of a local female poet come true – she had long wanted to have a book of her poetry published but could not afford it. Novopskovska hromada opened an information and educational center in this short time set. Despite the fact that by the end of the contest the TV hosts assigned an equal number of points to the hromadas, TV viewers of the show were most impressed by the story of Buzka hromada of Mykolayiv region that united their efforts to help a man who is raising three children on his own. Video of the episode. 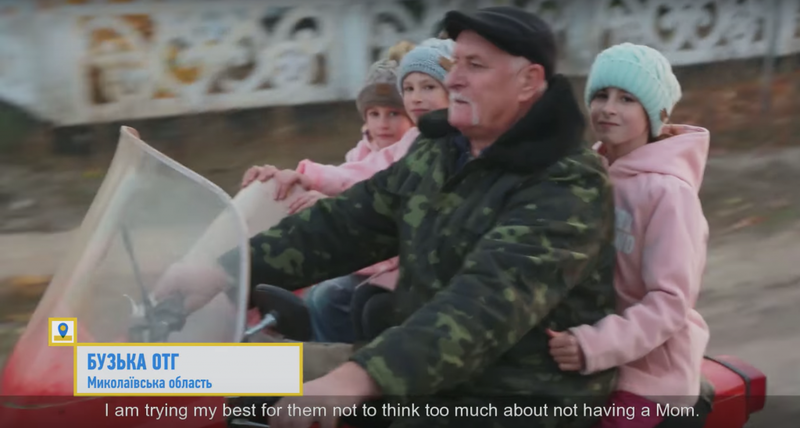 In Buzka hromada a widowed and retired single father Anatoliy Kaidanevych is taking care of four daughters. The oldest one now lives in Kyiv, while the three younger ones live with Anatoliy – they are 11-year-old Viktoria, 10-year-old Daria, and 8-year-old Maria. He remained the only one to handle these responsibilities seven years ago after his wife died. The family lives in a village and the man is retired, so the crop from their own orchard contributes to the modest budget of this large family. Anatoliy works a lot, the girls are attending school. The small house where they live is clean and cozy although very basic. In 2016 there were over 1.400 multi-child families in Ukraine (having three or more children) with the single father. To compare, in the same year there were 33.775 families with the single mother. Compared to the situation in other countries the number of single-parent families in Ukraine with single fathers as central figures is much lower than in the Western world. Thus, in the US these families make up 15 percent of the overall single-parent families, in France – 20 percent, while in Ukraine they’re almost three percent. “It is not in my nature to be asking for something,” Anatoliy Kaidanevych told the TV channel as the show was being filmed. “I am trying to make each and every effort so that my children feel good and think of the fact that they have no mother as rarely as possible.” He plaits the girls’ hair and drives them to school or a shop in an old three-wheel bike trailer. When the hromada representatives came to the family with an idea to help, they asked the children what their dreams are. 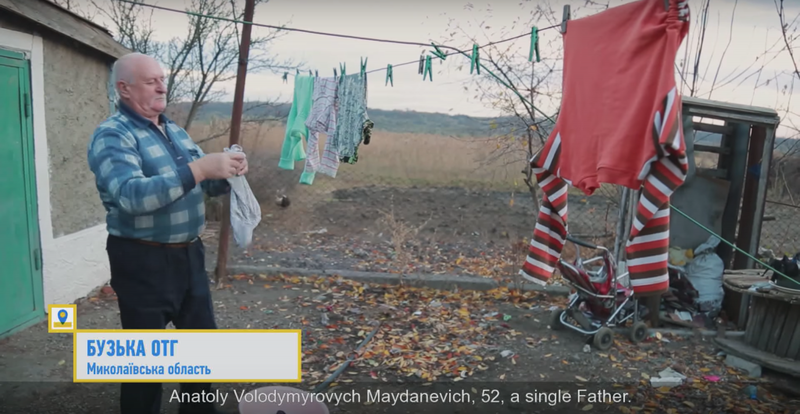 “I would like our father to have a good health,” 8-year-old Maria says. “And that we have our mother with us,” older Viktoria added. Meanwhile, the hromada representatives see the obvious: the girls are sleeping on old couches, younger ones – in one bed as there are no other ones available in the house. The hromada then decides to construct quality individual beds for the three girls over a day and a half and thus arrange a cozy and comfortable place where they can have a rest in the tiny space of the house. A local carpenter would work day and night with his son to be in time and produce the hand-made furniture items. In parallel, a group of hromada enthusiasts are going door-to-door to collect donations for purchasing matrasses, coats, linen etc. Another group of people then went to a shop to buy these items and bring them in time. When everything is ready half of the village gathers outside of the house of the Kaidanevych family. Some help install the beds, some adjust the linen, others are arranging the new clothes and small presents they just brought. Senior ladies are carrying balloons. The girls were at school. When they were back they did not recognize their room. It would be hard to imagine the children being more excited and happy, their father was touched as well. But the main thing is that the 48 hours of joint work united the entire hromada that resolved an uneasy and urgent task. Genuine emotions of the protagonists of this episode of the reality show have touched millions of TV viewers in Ukraine. While beyond the emotions it clearly demonstrates that to make someone’s dream come true, it’s not always the president or the government, a law or a provision, that is needed. Sometimes attention and intent to help the people who live nearby are enough. The people united by a joint intention to make their life better.